Coached 250+ ranked players, USOC Doc Counsilman Award 2012. I am a USPTA Master Pro & PTR International Master Pro, 1of 10 persons worldwide to have both. 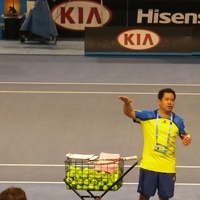 I am also a USTA High Performance Coach and have a PTR Master of Tennis in Performance, the only person to have all 3. I was awarded the 2012 US Olympic Committee Coach of the Year - Doc Counsilman Award & presented at the 2014 Tennis Australia Coaches Conference & 2015 PTR Italia Forum. I was with the USTA National Sport Science Committee for 8 years & am certified by NSCA (CSCS), iTPA (MTPS), Etcheberry & Academia Sanchez-Casal. Plus, I have a doctorate in sport psychology. I have spoken at over 30 conferences & wrote over 100 articles. I was President of both PTR & USPTA New England, a 5-time Pro of the Year and have trained/certified over 1,600 coaches. Doug can recommend a location or come to any court inside the highlighted service area below. "Great evaluation. Have a clean plan for further trainning." "Jonah who is 41/2 had a great time Doug was great. He was very encouraging towards him Jonah cannot wait for his next lesson"
"Very professional and fun to play with. Loved Doug's approach with a mixture of skill assessment, practical tips, and pro secrets. Can't wait for our next lesson!" "Doug is an excellent coach. He is very patient and effective. " "The lesson with Doug was great. A few years ago I tried to pick up my racquet and couldn't figure why I couldn't play.like I used to. Doug found the problem immediately and had my strokes almost back in minutes. I am very grateful to him. He was very patient and knowledgeable." "It was great and has already helped bring my game up a notch." "Lesson was great! He engaged Sara, asking her many questions about her game, etc. His instruction was solid and his input on the direction of her "career" was much appreciated!" "Doug is the best! Taking lessons with Doug has really improved my game; he explains things really well and is really nice to work with. "